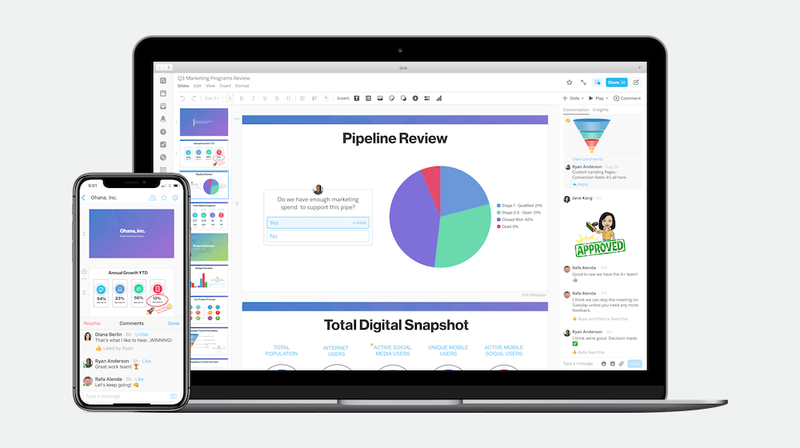 Salesforce (NYSE: CRM) announces a new presentation tool to challenge PowerPoint and Google Slides. But the approach the company has taken with its competing product is very much different than the other two services and critically important for the way teams work today. Quip Slides is a presentation tool with all the bells and whistles built mobile-first. On top of that, it will help your team collaborate, interact, communicate and drive decisions in real time, the company says. And as part of the Salesforce ecosystem, it will also capture user feedback and show always-up-to-date insights on Salesforce data. For small businesses owners who are looking to merge the different digital solutions they use into fewer products, Quip Slides may be worth consideration. Best of all, Quip Slides is affordable for small teams working in single or multiple locations. Salesforce purchased Quip — a collaboration app — for $750 million in 2016. The addition of this company brought documents, spreadsheets, chat and now slides under the Salesforce umbrella with the goal of eventually having a comprehensive collaboration solution. With Quip, you and your team can work together more efficiently across devices and platforms, the company says. Today’s digital technology makes it possible to fully interact with team members no matter where they are in real time. Quip Slides is embedded with live data from Salesforce and third-party systems presented through Live Apps. With these features, you can deliver up-to-date content with any slide so everyone in the team — and your audience — will have the best available information at the time. This includes interactive feedback prompts and engagement insights to surface and measure participation data. At any given time you can view the presentations with the most or least activity. Quip Slides is available now on Mac, Windows, web, iOs, and Android with a free trial. Unlike other free trials, it is being offered based on activity and not time. This means your team can really take it for a test drive without having to worry about time limitations. The free trial comes with all of the Quip Slides features — including unlimited users and storage — and you don’t need a credit card to take it for a spin. If you want to continue with Quip Slide, there is a simple pricing structure, which is ideal for small businesses.